This badge was issued to Adrian Soeranto on 07 Jan 2019. The badge earner understands how to do the following: build an app in IBM Cloud; build simple and complex queries with the Discovery service; create a chatbot that interacts in natural language; train the Conversation service by creating intents, entities and dialog flows; reveal the emotions and sentiment found in hotel reviews using the Tone Analyzer service; and uncover how customer preferences can be gleaned from social media data by using the Personality Insights API. 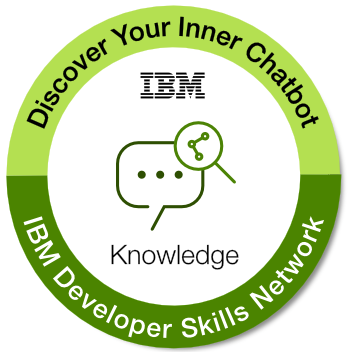 Completion of the developerWorks course "Discover your inner chatbot: find valuable insights with IBM Watson". Passing the in-course assessments with a score of 90% or higher.